Al Jazeera’s English service is very slick, very professional, and if you want, very biased (depending on who you talk to). But for most Americans without FTA dishes or access to some IPTV programs, they never had an opportunity to judge for themselves. Until now. MHZ Networks, a non-profit in DC that rebroadcasts nearly 10 foreign news services is adding Al Jazeera English service to their lineup, so says the Washington Post. MHZ currently offers Russia Today, France 24 and Euronews to name a few, but AJE will certainly be a eye-catching event. I’ve watched AJE sporadically over the last few years on the FTA dish and later on Livestation and other tv players. It’s not my first choice for news (it is heavily focused on the Middle East, no surprise) but it isn’t bad nor is it as biased and opinionated as the more famous network Al Jazeera, called the Bin Laden channel by many of its critics. Anyway, Comcast and Verizon Fios should see the new channel soon. No idea when we’ll get it out here in the sticks (and since I don’t have cable I probably never will figure it out). Still worth checking if you want to hear a different slant on thing. Its about time Aljazeera English is available to wider audience, so they can now form their own opinion by actually watching the output. Not only do they cover the middle east extensively but also have excellent coverage from South America, Africa and Asia. Biased…I dont thinks so….how biased is Fox News for example. The US public would be well served to open their eyes and ears to the world! Aljazeera English cover events that other major US companies do not. When CNN was covering Michael Jackson story 24/7 or more Aljazeera was actually informing the world of major news stories. 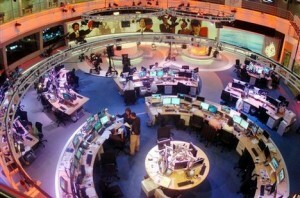 As CNN, NBC, ABC, CBS and BBC close down many of their foreign desks Aljazeera is expanding. Their reporters and anchors include very experienced ex CNN , ex BBC and ex ITN people. Aljazeera can be watched in very good quality on the internet with Livestation and can be watched live 24/7 on the iphone…what other major network’s full output can be watched on the iphone?